As the US demands more from Europe and castigates it ever more stridently, it’s increasingly clear that Russia is missing a historic opportunity. If President Vladimir Putin hadn’t made Russia an unreliable partner for its neighbours, he’d be poised to realize his fondest dream: of displacing the US as Europe’s security guarantor. US pressure on Europe has gone far beyond President Donald Trump’s tariff threats and military-spending harangues. US officials are demanding obedience in many other areas, too. This month alone, Gordon Sondland, Trump’s envoy to the European Union, said the EU “really should be linking arms” with the US to “check China” in every respect. Richard Grenell, the US ambassador to Germany, lashed out at the Nord Stream 2 pipeline project expanding Russian natural gas exports to Europe. Vice President Mike Pence, speaking in Warsaw on Feb. 14, deviated from the written text of his speech to strengthen his demand that European countries abandon the 2015 Iran nuclear deal as the US has done. At the Munich Security Conference on Feb. 16, Pence again exhorted Europeans to fall in with the US on Iran, on market access for Chinese companies such as Huawei and on Nord Stream 2. Despite European officials’ determination to preserve what’s left of the US-led liberal world order, the cracks in the transatlantic alliance are obvious. They were one of the themes of the Munich conference, and they showed in the prolonged silence Pence faced when he conveyed greetings from Trump, expecting applause in response. And polls in key European countries show that once relatively pro-American voters no longer trust the US. This month’s DeutschlandTrend survey shows that only 24 percent of Germans consider the US a trustworthy partner; over 50 per cent did before Trump’s election. Europe needs a counterbalance to US influence. Had it not grown so dependent, US officials would have had to scale back their demands and start talking to Europeans as equal partners. Ideally, the EU shouldn’t just be able to stand up for itself economically (to be able to stand up to US sanctions when that’s in the European interest) but also be capable of ensuring peace in its neighborhood — the Balkans, Middle East, North Africa and the former Soviet Union — and suppressing terrorist threats like the one from the Islamic State. The North Atlantic Treaty Organization has these functions now, but, for historical and U.S. policy reasons, it’s more focused on the more hypothetical Russian threat. Europe is a long way from both economic and military independence from the US, though. Stronger ties with one of the other two major powers, China or Russia, would be another option. And if Russia were to try weakening Europe’s US dependence, it wouldn’t be starting from scratch. Ever since Mikhail Gorbachev’s years as leader of the Soviet Union, Russia has sought a “new security architecture” in Europe that would reduce the importance of the North Atlantic Treaty Organization and instead empower the Organization for Security and Cooperation in Europe, a large but amorphous grouping that includes Russia. That idea is still alive in Moscow: At the Munich conference, Foreign Minister Sergey Lavrov mentioned it again as he called for closer economic and security cooperation between Europe and Russia. China is less of a natural partner for the EU than Russia because of the cultural distance between them. According to the DeutchlandTrend survey, 35 per cent of Germans consider Russia trustworthy; 28 per cent think that of China, making it only slightly more attractive than Trump’s US as a partner. An alliance between the EU and Russia would have obvious economic and geopolitical advantages. They share a border. Russia has the resources and the military might Europe needs to police its neighborhood; that could be used to ensure stability in places such as Syria and Libya. If Russia were on the same side as Europe and involved in joint security planning, much of the tension would be gone from the western Balkans. If NATO lost its importance as the main security umbrella for Europe and that role passed to some structure in which Russia has a say, Russia wouldn’t need its frozen conflicts and buffer zones in the former Soviet Union, either. The conflicts would be easier to resolve with European participation. But only marginal political forces in Europe talk about an alliance with Russia, even now that the US is unpopular and increasingly perceived as unfriendly. Lavrov’s appeals in Munich fell on deaf ears. It’s easy to see why. The EU and the statehood of the countries within it are based on values and rules as much as interests. Even if it’s unclear what values Trump’s US stands for and what rules it respects, at least it’s a functioning democracy that doesn’t depend on the whims of a dictator or an oppressive state ideology. European leaders have to fight fair elections, build coalitions, deal with independent-minded judges and a domestic opposition that can’t be steamrolled. It’s difficult for them to accept a corner-cutter as a trustworthy partner. And indeed, regimes run by “bosses” and “strongmen,” according to a classification developed by political scientist Olga Chyzh at the University of Iowa, are more likely than democracies to enter into international agreements but are less likely to comply with them. Russia was too weak to count in the 1990s, when it tried to adopt European values and rules, and its institutions were too unstable. By the time Medvedev pouted in Berlin about a wealthier and more powerful Russia’s absence from the European security architecture, the country had turned firmly authoritarian, with rigged elections, a puppet judiciary and strengthening media censorship. It couldn’t be a reliable security guarantor because it was a potential predator. Putin’s aggression against Ukraine in 2014 only proved this, strengthening European leaders’ resolve to stick with the US security umbrella because it was so well-suited to containing Russia. 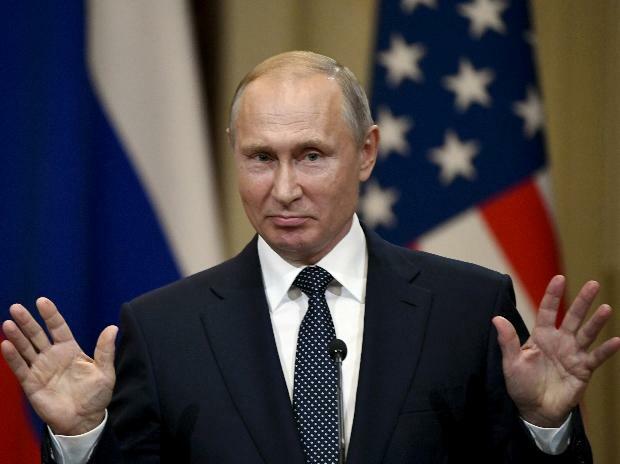 Putin, for whom resistance to US hegemony has long been a foreign policy priority, shot himself in the foot twice, first by dismantling Russia’s institutions in Europe’s plain sight and then by attacking Ukraine after it moved toward closer ties with the EU. Of the two strategic miscalculations, the second may seem more critical: Starting a war not far from the EU’s borders is not the way to build alliances. But the swing toward authoritarianism was the source of all future errors. In some cases, we’re simply told: Don’t be so prickly, so scrappy in international affairs, and as for democratic development and human rights, these are less important and we’ll close our eye to this. Even if Russia turns towards democracy after Putin, the opportunity for displacing the US as Europe’s partner probably won’t be there anymore. By then, Europe will find other ways to ease out of US dependence — or to sink deeper into it if it surrenders to Trumpian demands.